Jesus (Chuy) Garcia started playing soccer with El Cerrito Soccer Club at the age of five. He tried out for the U10 Mavericks Traviesos, and played with the Mavericks for seven years. He also played for El Cerrito High School on their Varsity team for three years, earning First Team All League his Senior year. 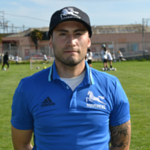 Chuy played collegiate soccer at Merritt College. He enjoys playing soccer as well as coaching the game, and wants his players to enjoy and love the game.